Chrysanthemum exists in various colours including red, yet Chinese paintings rarely depict it in any colour other than yellow. Qi Baishi (1863-1957) is among the few Chinese artists who depicted these flowers in bright and bold colours. Qi Baishi is one of the most renowned artists of 20th century China. A native of Xiangtan, Hunan province, he was apprentice to a carpenter in his early years and later became a professional painter. He finally settled in Beijing in 1920 and developed his mature, vigorous style. 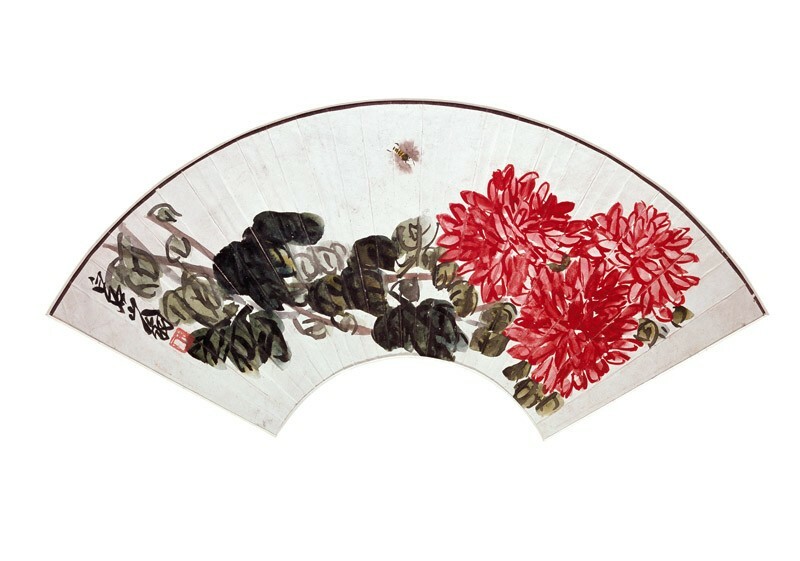 Qi is famous for paintings of plants featuring strong contrasts between ink and colour, and for simplicity in plants and delicacy in insects, as demonstrated in this large fan painting. Presented by Sir Humphrey Prideaux-Brune, 1949. Qi Baishi was born into a poor agricultural family in Xiangtan, Hunan province, but spent most of his life in Beijing as one of the most illustrious painters of modern times. As a teenager he was apprenticed to a carpenter and in his twenties began studying seal carving and painting. He travelled widely within China and in 1912, at the age of fifty-five, he settled in Peking. With the encouragement of Chen Hengke (q.v.) he became extremely successful as both a painter and a seal-carver, eventually establishing a large household, many members of which were engaged in painting. His work introduced new subject matter - he is particularly known for paintings of crabs and shrimp, for example - and is admired for its directness and simplicity. At the age of sixty he knocked two years from his age for auspicious reasons, complicating the dating of his later works.